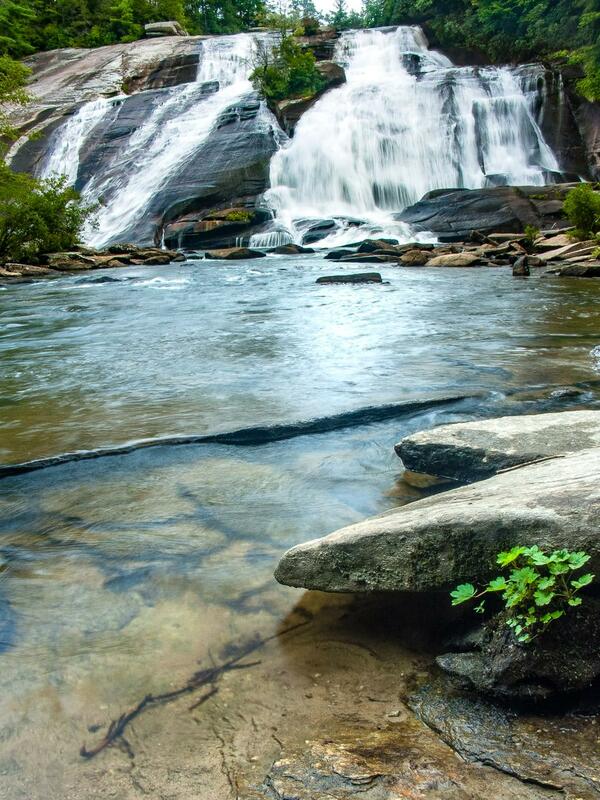 This is the highest falls on the Little River. The water spills over a huge, steeply sloping rock face. It's a wide falls with lots of character; everything from gentle slides to roaring rooster-tails and a few short free-fall sections can be found within it. A covered bridge - once to be part of a private housing development but now part of the State Recreational Forest - spans the river just above the falls. From the intersection of US 64/US 276/NC 280 in Brevard, NC, take US 64 East and drive 3.7 miles. Turn right on Crab Creek Road. Drive 4.3 miles and turn right on Dupont Road. Go 4 miles to the parking area, which is on the left. (The road changes to Staton Road along the way. It will climb and then begin a long downhill, at the bottom of which is the bridge over the Little River and the Triple Falls parking area. Go another 0.9 mi past this bridge to the parking for High Falls). Take the new High Falls trail from the visitor center (left of the gravel Buck Forest Road). This new path winds through the woods and across a bridge on a gentle grade, and is a much nicer alternative than the gravel road - especially on hot, sunny days. Stay straight at the Triple Falls connector. At the next intersection (with some gravel roads), continue straight across to stay on the High Falls trail. This old gravel road climbs, then descends gently for about 0.2 mi to a picnic shelter straight ahead, with a good view of the falls. Or bear right when you see the picnic shelter to reach an overlook along the High Falls trail. From the overlook, you can reach the base of the falls by continuing straight for another 0.2 mi on the High Falls trail, then turning right on the River Bend trail and going 0.3 mi. upriver. Return to your vehicle on the same path.